Regardless of how we perceive characters, black stereotypes extensively permeate media. From the Black Dude Dies First to the Black and Nerdy to the Sassy Black Woman, and everything in between, on-screen portrayals of black characters lean heavily on tropes that have been ingrained in media since its birth. Abhorrently disgusting and inherently wrong, these spurious portrayals paint black people in ways that are not reflective of the population. It’s discrimination feigned as fiction that was initially meant to reinforce that African/African-American/black is both inferior and other. Although entertainment media—films, games, music, novels, etc.—have gotten better at depicting people as complex, nuanced individuals in recent years, it is still evident many struggle with what the hell to do with black characters. Unfortunately, though Blizzard has succeeded in the past (re: Overwatch’s lesbian character, Tracer), with its latest character the company stumbled, creating nothing but a talking, punching, walking stereotype. Doomfist, Overwatch’s latest character (or villain, to be more precise), is the epitome of creation confusion, as he is just about every black stereotype thrown together. First impressions are hard to overcome, and the impression Doomfist leaves is not a good one. Based on design and lore, Doomfist—real name Akande Ogundimu—falls into quite a few different stereotypical categories. According to TV Tropes’ Black Index, Doomfist can fit perfectly into the African Terrorists, Angry Man, Bald Black Leader Guy, Blaxploitation, and Scary Black Man molds. TV Tropes describes the African Terrorists stereotype as “terrorists from sub-Saharan Africa who primarily operate out of their home continent, carrying out guerrilla operations against domestic and foreign governments and frequently being involved in the drug trade.” Although Doomfist doesn’t fit into the entirety of the sentence, the prevailing theme—African terrorist—still runs in Doomfist’s origin. Doomfist operates out of Oyo, Nigeria. It doesn’t help that, according to TV Tropes, African Terrorists are from sub-Saharan Africa, and Nigeria is part of this collection of countries. As stated by Doomfist’s lore on the official Overwatch page, “As the new Doomfist, Ogundimu rose high in Talon and helped to orchestrate a conflict that the organization hoped would someday engulf the world.” The idea that Doomfist would used Talon, Overwatch’s terrorist organization and main antagonistic force, to choreograph a terrorist attack and shroud the world in war directly aligns with that of the African Terrorist, a theme used to perpetuate the bastardization and othering of the black population. Just based on this and not reading the rest of his lore, you can already guess what happens: Ogundimu kills his mentor Akinjide Adeyemi, the second Doomfist, and claims the role of Doomfist (and the eponymous gauntlet), as well as rising in the ranks of Talon to become part of the organization’s Council of Leaders. How banal and mundane, as if we didn’t see that coming from a mile away. It is here that Doomfist’s predictable origin story insidiously connects to the Scary Black Man. TV Tropes defines this stereotype as a black character who his quieter, much larger and more intimidating than the other characters. These characters—who happen to also fit into a plethora of other categories like the Token Minority and the Gentle Giant—aren’t always evil; they are just scary to both the characters in the series and the audience. Doomfist isn’t the largest Overwatch’s roster—you’ve got Bastion, D.Va’s mech, Roadhog, Winston, and, the biggest of them all, Reinhardt—but he is certainly the most intimidating. Doomfist’s physical appearance—angry scowl, large muscles, and prepared stance—and the societal stigma of blacks being hyper aggressive and quick to anger make him far more threatening than a gorilla in a space suit. Once more, looking into Doomfist’s lore will provide evidence of this rhetoric: Not only did Ogundimu have to kill his teacher to become the character we know him as, Ogundimu is also incessantly referred to as “not a brute,” having “a surprisingly calm demeanor even under pressure,” and fostering “an intelligent, almost philosophical mind.” His stoic behavior and hyper aggressive attitude in combat—as seen in his various facial expressions, a medley of furrowed brow, gritted teeth and squinted eyes—establish that he is intimidating both on and off the battlefield. I mean, instead of using an actual weapon in battle, the dude uses his fist to punch his opponents to oblivion. Nothing can be more terrifying than a big, bald, beefed-up black guy charging toward you with an oversized robotic arm, planning to punch your head clean off your body. Even though this sounds like the personification of badassery, Doomfist is nothing more than a scary black man. Ultimately, Doomfist is a problematic character for many reasons. He’s an awkward combination of stereotypes and clichés, and, sans the robotic arm, he looks like far too many black characters before him. For Blizzard to create a queer character and have that character be the poster child of Overwatch, to the point where she’s so synonymous with the game that you can’t help but think of her when it’s mentioned, is commendable and impressive. 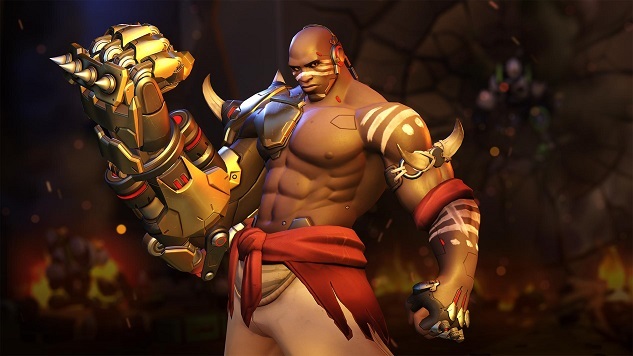 However, to then create such a thoughtlessly stereotypical black character is both disappointing and frustrating: Disappointing because we should expect more from Blizzard (and developers as a whole), and frustrating because Blizzard had done well before Doomfist. Developers should avoid using ethnicity as a way to construct characters and strive to use ethnicity as an identification for characters. Forget the name Doomfist for a second. Akande Ogundimu shouldn’t be black because black people are hyper aggressive and that makes sense with prosthetic, robotic arms. (We’re not hyper aggressive, I assure you, though robotic arms would be cool.) He should be black just because, in designing the character, he was born black. Ogundimu touts that “only through conflict do we evolve.” I’d like to take that a step further: only though accurate depictions do games evolve. Jeremy Winslow is a Californian critic and essayist with big glasses who furiously types into WordPress and yells into the ether. He’s written for Feminist Frequency, GameSpot and more, and co-launched the small entertainment website Ground Punch. Listen to him yell on Twitter. Or don’t. That’s fine.